I like good karma as much as anyone but what I'm all about these days is the delicious karma! Behold my latest obsession: Karma Bakery's chocolate chunk walnut cookie. You can meditate on it or you can get yourself one of their cookies and experience true bliss. Karma Bakery, out of Auburn, is a small operation run by Karmen Canestaro. With a mission that is all about good health, local and organic ingredients, and putting out real, delicious food, Karma Bakery is quickly becoming the darling of the CNY Regional Market. I've not had one of the beautiful multi-grain loaves they sell but I'm all over the cookies. I love the banana nut and peanut butter versions but the chocolate chunk walnut cookie is so good, it has me at the market before 7:00 am to pick up or reserve my stash before they sell out. There is something about the slightly nutty taste of spelt flour, ground oats, walnuts and slabs of dark chocolate chunks that takes me to a happy place. There are other healthy ingredients in there like flax meal and maple syrup (no refined sugar or agave--check out their website to read why). I can serve them to my vegan friends without worry and to my non-vegan friends without apology. All I know is that after a busy day of work, a long run or other training session, and the other things life throws my way, sitting down to a cup of tea and a bite of one of these cookies is the best karma there is. You can buy Karma Bakery's cookies and breads at the Regional Market on Saturdays from 7am-1pm and beginning this week you should also be able to find them at the Syracuse Real Food Co-op. First up: Jennifer Ward's by lines on the Atlantic Monthly Food Channel website. You know Jen--Fresh Cracked Pepper Jen. Well, her piece on Coffee in Haiti after the earthquake is getting tweeted all over the blogosphere. That's our girl! I'm finally pulling some decent looking--and great tasting--espresso shots. But when I'm getting my latte's on the run--the shots pulled at Funk 'N Waffles is blowing my mind. I checked them out after a commenter sent me there (you see, your comments really do help me out) Their shots of Gimme! 's Leftist were so spot on, I could taste the nuance of the flavor profile through the steamed milk--genius! Local cooking oil! Have you had some of this butternut squash seed oil--it is fantastic! It has a smooth and nutty taste that is just perfect for roasting up all of those root vegetables that are still left in the larder. And there's something about roasting butternut squash in its own oil seems just so right. I picked up this bottle at Max Market in Pittsford but check out the Syracuse Real Food Co-op to get some closer to home. Update: I guess I posted too soon. The Co-op doesn't carry it but I put a note in the suggestion box so perhaps they will soon. Based in Geneva, NY and Boston, Stony Brook is all about the deliciousness--you may have also come across their cookies. Trust me, if you see them, don't pass them up. A cafe destination for your country drive. Red and White Cafe is in DeRuyter and I plan a more extended post on them because there's lot's to tell. But for now, let me just say--this place rocks! This is the real deal--authentic to its community, delicious house-baked breads, doughnuts, and other treats, good coffee, fantastic people--you have got to get there. More on them soon.... Thanks to Neil Miller for introducing them to me. Speaking of Neil--have you checked out his blog lately? Check out his post on our lunch at Circa and dessert at Red and White. So how about you? What's blowing YOUR mind these days? What? Really? Thanksgiving is next week? Seriously? Next week? Are you getting the picture that this has snuck up on me? I've got beets, carrots, squashes, local sausage, root vegetables of all kinds, and some ideas about wine but still need to pull this meal together. What are YOU contemplating for your Thanksgiving feast? I came, I ate, I had a Ball! This was item number one on my still unpublished autumnal foodie bucket list--hitting the annual Testicle Festival at Rileys. I finally made it yesterday for lunch and I have to say, I don't know whether it was the balls or the good company but after dancing on the edge of the flu this weekend I'm feeling MUCH better! This is the last week for you to go nuts at Rileys so if you haven't checked out this neighborhood gem in a while--now is the time. Their entire menu (which changes fairly often) is also great so you can go and have a great salad or salmon, or burger. But for the record--the balls were delicious! Okay, consider this a photo deluge of some great food to be found in New York City--it is by no means comprehensive--just deliciously memorable. Actually, for all the great food the Big Apple has to offer, it can be awfully difficult to figure out where to eat--especially if you want to eat fresh food in season without breaking the bank. So if you're considering a trip downstate this summer, check out these eats. The New York Times is one of my guides to good food and that's how I got the tip about the fairly new Get Fresh in Park Slope, Brooklyn. This brightly painted, homey restaurant does the locally-sourced, seasonal menu and contains a pantry shop at front to take some tasty vittles back home. I took my Mom there for lunch back in May and enjoyed a simple pasta dish loaded with cauliflower, black-eyed peas and house-made cheese while my Mom went the breakfast sandwich route--both were great. Now this is the kind of fresh Mex I'm talking about. Just over a year old, Cabrito in the West Village brings the heat. 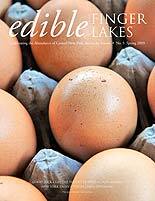 Michael Welch and his wife Zoe Becker--the team behind Edible Finger Lakes--turned me on to this place. Michael had met the chef the week before and we were drawn there by the prospect of eating Finger Lakes-sourced pork. Alas, we were too busy chowing down on Lengua y Tomatillo Tacos (that's braised cow tongue), short ribs and house-made chorizo and missed the local pork. Butif you go, do like we did--order up a bunch of food, share liberally, and then walk to the corner and grab some gelato--hmm, hmm, hmm!